I don’t get it. ONe message is get your flu shots. Whats the other message? Flush – ots? But that doesn’t make any sense. Skeleton in Black? You can die if you don’t get your flush-ots? 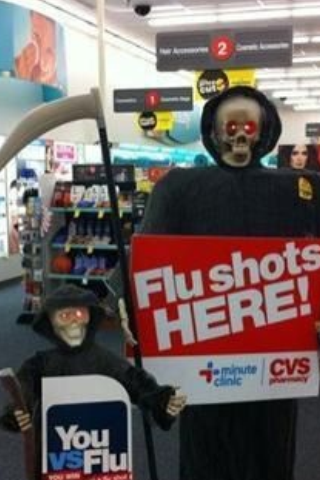 OK–so Skeleton in Black symbolized death, and that mixes up the message to stay healthy by getting a flush-ot or does it mean that vaccinations are evil Obama Socialist Medine meant to enslave tax payers? Yeah—it is a very mixed message. or more like Class Warfare? LOL. That is funny! Funniest part, or saddest depending on how you look at it, is that some people STILL can’t rub their tummy and pat their head or keep 2 thoughts in their head at the same time. So instead of the rational, “Oh, nice display. I get it, Halloween is coming and Flu season too”. You get idiots thinking, “Obama is trying to kill us all with mandated poison flu shots”. LOL! Buy a Flue Shot HERE or DIE!! !, just like all the people who Died of the Mad Bird Cow Swine Flu SARS disease! Funny as hell. Clueless assholes. “They Live part II” starring President Obama and Fed. Chairman lil Ben Bernanke. So–I take it that there is not a mixed message but rather two separate messages? Get your flu shots and its Halloween? So, where is the sign for frozen turkeys? I don’t see no stinkin’ mixed message! #8. I’m pretty sure it’s not Halloween, but I understand the marketing practice of getting the stupid consumer primed early. 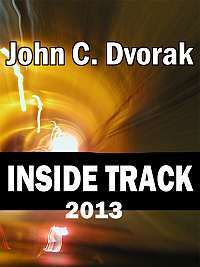 You guys gotta understand — Mr. Dvorak gets a serious dose of heartburn anytime flu shots come up in conversation. It comes up every year in the Fall. Bad Behavior has blocked 13890 access attempts in the last 7 days.